Trotting out a coffee cart staffed by a friendly seeming coffee-slinger, Kimmel explained to his audience that, while the looming shutdown issue might be complicated, some visual aids might help sort things out. Prefacing the bit by pointing out that the crux of the shutdown is the Children’s Health Insurance Program (CHIP), a massively popular, thoroughly essential program designed to help some 9 million low-income American kids go to the doctor, Kimmel let a familiar flash of anger creep into his patter. (Trump and the GOP are also holding the fates of hundreds of thousands of DREAMers hostage as well.) As he noted, CHIP—which Republicans in congress have allowed to linger in limbo for an astonishing 100 days—is a slam-dunk to pass, if GOP leaders Paul Ryan and Mitch McConnell would let it come up for a vote. Which they won’t, preferring instead to use it as a “bargaining chip” (not a pun, since sick and dying kids aren’t really a hoot) in order to pass a spending bill that includes, among other odious things, money for Donald Trump’s possibly see-through, possibly dotted-line, maybe somehow Mexico-funded Game Of Thrones border wall of racist nonsense. 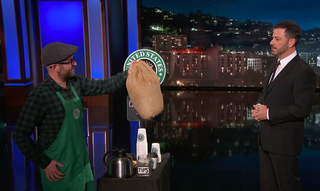 So, starting his little playlet, Kimmel approached the bearded barista and requested a cappuccino, only to be told that, in addition to his delicious coffee (which all right-thinking people love and enjoy), he’ll have to also purchase a big, burlap “giant bag of hoseshit.” Which, to be fair, some people—mostly those with very specific fertilization needs—might also enjoy, but not as a mandatory, calamitously expensive throw-in instead of, say, some nice biscotti. “But what if I just want the cappuccino?,” asked the flummoxed Kimmel, causing the intransigent barista to get immediately hostile. “Whoa buddy,” snapped the angry barista, “You start making demands like that, and I will shut down this entire coffee establishment!” And then he kicked over the coffee cart. And that’s a wrap on a functioning U.S. government. Tip your congressman.